HAGERSTOWN, MD – Reach of Washington County is thrilled to launch Bridge to Change, a new program that develops human potential through purposeful work experiences for the homeless. This program helps prepare those who are ready for change to develop confidence and skills to enter a job services program or permanent employment. “We are very excited about partnering with the city and supporting our community’s most vulnerable population towards independence” said Dana Jenkins, Reach’s Executive Director. Jenkins stated that Bridge to Change is a pilot program for Reach Cold Weather Shelter residents and clients. The program will begin in late-spring/early-summer. Case Managers at Reach will select Reach clients based on readiness for change to participate in the program. Reach will work with the Department of Public Works each week to address areas of the city that need to be cleaned up. A supervisor will take a team of 4-6 program participants to work in the areas designated by the City. The team will work in four-hour shifts, three days a week. The team will return to Reach to journal and work with case managers on additional services and support. Reach expects to have 50 participants in the program within the first year. The anticipated program outcomes include: participants entering a job service program or permanent employment, participating in case management services, attaining permanent housing, and participation in Reach’s Financial Literacy program. Bridge to Change was modeled after a homeless work program in Albuquerque, New Mexico called “There’s a Better Way.” There’s a Better Way was developed in 2015 with a partnership between a homeless service organization and the City of Albuquerque. At the origin, the City provided $50,000 toward the program to buy a van and pay panhandlers to work. Since the inception of the program There’s a Better Way has experienced the following successes: 1) They engaged 1744 unduplicated workers, totaling 7545 jobs in NM through 8/31/18; 2) 24% sought out employment and 80 individuals secured permanent employment; 3) 23 households were placed into stable housing and; 4) 22% engaged with the Behavioral Health Department for either mental health or substance abuse treatment options. The FY18 budget for the program increased to $375,473. Furthermore, 15 other cities across the U.S. have modeled a program off of the NM’s program. Jenkins spent time over the last 6 months, talking to leaders in cities across the U.S. currently running similar programs. Many are run like the NM program and others are quite different. With such a varying degree of programs and so many good ideas Jenkins, in conjunction with Councilwoman Shelley McIntire; Jeannie Asbury, Deputy Director of Reach; and Jill Zamostny, Director of Housing and Case Management at Reach, created Bridge to Change according to the needs and best interests of our community. Jenkins and Councilwoman McIntire have discussed the program with a few community leaders and the support has been overwhelmingly positive. They are preparing to tour across the city talking with many about the program. If you are interested in meeting with them, please contact Dana Jenkins at Dana@reachofwc.org. The program will be funded through grants and gifts from private donors. Reach has already applied to several grants including CDBG funding. Anyone interested in becoming a donor for the program should contact Dana Jenkins at Dana@reachofwc.org. Since 1995 Reach of Washington County, a grassroots organization, has worked to prevent and resolve homelessness by serving the homeless and working poor of Washington County. Reach programs range from safety net to self-sufficiency. We provide a seasonal Cold Weather Shelter and year-round Case Management for homeless adults. We also run a Day Resource Center that provides financial assistance to serve those facing crises as well as self-sufficiency programs including Open Table and Financial Literacy classes. You can learn more about Reach programs at: http://bit.ly/2PP6vDC. Reach has 1600 volunteers who donate an estimated 15,000 hours of service to the Reach programs annually. During the last shelter season 213 individuals (aged 18-75) slept in the shelter for a total of 6,664 bed nights. Over the last year we assisted 254 families to avoid eviction and/or get into independent housing, 38 people were provided emergency lodging placements, 57 were assisted with emergency utility bills and many more were provided a variety of imminent needs. Once again we are incredibly blessed to have generous donors providing up to $25,000 in matching gift funds! We challenge you to take advantage of this opportunity to donate once and make twice the impact between now and December 31, 2018. Our mission is to support and strengthen the community by preventing and resolving homelessness in Washington County. We empower individuals and families to move toward independence and stability through compassion, education, advocacy, and resources. To learn more please check out our video. Due to generous support of the community in 2017 we were able to support 3,500 Washington County residents through our programs: a place to sleep in the cold weather during a brutally cold winter (6,664 shelter bed nights), case management, crisis services, mail services, eviction prevention, IDs and birth certificates, permanent housing, financial literacy, and crisis support. This year our dedicated case managers have already permanently house 38 individuals. None of this would be possible if it were not for your support. That is why I am writing to you today. With the addition of a new case manager and program growth, we can help more people attain independence. Your support will help us provide critical services from homeless prevention to independence which includes permanent housing. How amazing is it that together we can help our county’s homeless move from the streets to a warm bed with food and job possibilities? 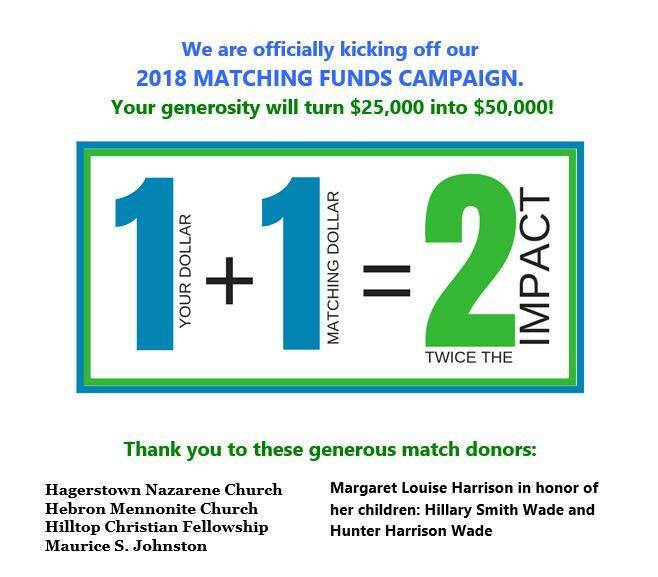 We want to extend a big “thank you” to these gracious grant donors: Hebron Mennonite Church, Hilltop Christian Fellowship, Hagerstown Church of the Nazarene, Maurice S. Johnston, and Margaret Louise Harrison In Honor of her children Hillary Smith Wade and Hunter Harrison Wade. Please know that your gift will help individuals and families find housing security and peace of mind. Don’t let this generous matching donation slip away. Send your gift via mail with the enclosed return envelope or donate online at anytime between now and December 31. You must have a PayPal account to donate on our website (no fees added). 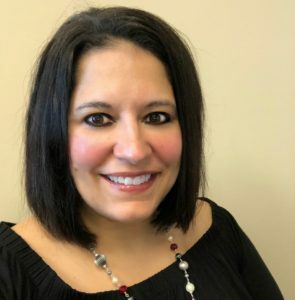 Dana Jenkins has been named the next Executive Director of Reach of Washington County by the organization’s Board of Directors. Mrs. Jenkins officially assumed the role on May 29, 2018. Mrs. Jenkins background uniquely positions her to assume this role, as Reach of Washington County’s third Executive Director. With significant experience in leadership, strategy and marketing in both the for-profit and non-profit sectors, Jenkins will advance the organization’s strategic plan and guide Reach’s future contributions assisting the homeless and financially disadvantaged populations. One specific area she will be focusing on is a housing first model. “I am humbled and honored to be part an organization with such a strong mission to help the most vulnerable population in our county. It is my mission to further support our clients towards self-sufficiency while helping guide efforts for long-term success. I look forward to working with our clients, staff, Board, 1,600 volunteers and community partners”. Jenkins holds a Master of Business Administration from the University of Phoenix, a Bachelor of Science from Carlow University, a Medical Marketing certificate from UCLA, and multiple leadership and digital marketing certifications. Jenkins comes to Reach with a plethora of experience. For the last few years, Jenkins was the CEO of her own consulting business where she helped entrepreneurs, small-businesses and nonprofits with strategic planning, leadership, marketing and social media marketing. Prior to that, Jenkins spent 16 years in the pharmaceutical/biotech industry where she received extensive training and experience while holding many leadership roles in sales, marketing, strategy, training and management. Concluding her career in the biotech industry, Jenkins was the head of a genetic division for the United States. For the last several years, Jenkins has been an asset in the community as she is the Vice President on two local boards as also chairs several committees. Taste of the Town, Reach’s annual fundraiser is Sunday, September 23, 2018 at Hager Hall. For more information about Taste of the Town, go to www.tasteofthetownwc.com. Visit www.reachofwc.org to learn more about the organization. Reach of Washington County is a grassroots organization which strives to prevent and resolve homelessness by serving the homeless and working poor of Washington County. Programs range from safety net to self-sufficiency. Reach provides a Cold Weather Shelter for homeless adults, Case Management, a Day Resource Center, financial assistance to serve those facing crises, and self-sufficiency programs; which include Open Table and Financial Literacy classes. During the last shelter season, Reach had 213 individuals aged 18-75 sleep in the shelter; equaling a total of 6,664 bed nights. Out of the 213 clients, 51 were case managed and 26 found permanent housing. Reach continues to prevent more Washington County residents from becoming homeless. Over the last quarter, Reach has assisted 52 families with avoiding eviction or getting into independent housing, 14 emergency lodging placements, assisted 12 families with emergency utility bills and assisted several others with a variety of imminent needs. So far this year, 68 county residents have taken Reach’s Financial Literacy classes.